Late-night food is hard to come by in Philly, what with droves of recent closings and the threat of shuttering for those that remain. But Shoo Fry, Center City’s new fast-casual spot where Underdogs used to live, is giving the other wee morning hour jawns a run for their money. Not only is the spot open until 3am on the weekends, the concept brings something entirely new to Philly: poutine. The space at 132 S 17th St was once home to the local late-night institution Underdogs. The name was apt for the space’s slightly below-ground entrance, the steps easily confusing to the visitors who headed over after the bars closed. Underdogs was a somewhat rare eatery for Center City, staying open until 3am on weekends to serve hot dogs and frites with different toppings and sauces. The storefront is also a stone’s throw from the long-running 24-hour bar Little Pete’s, which has faced zoning closures off and on for the last two years. While the ultimate fate of Little Pete’s is still unclear, the loss of Underdogs was one more gap in a city where after-hours food is already hard to come by. Co-owners Matt and Rachel Baiada opened the shop after a visit to Canada that apparently involved lots of poutine eating and the desire to bring the staple food back home. You may have already been able to find variations of poutine around different bars in Philly, like the Bru’s namesake fries and the pork belly version at The Little Lion. 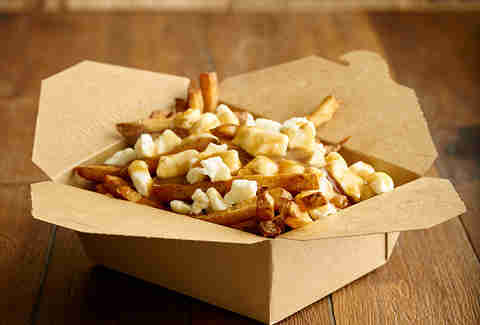 This smattering of dishes and the opening of Shoo Fry are only the beginning of the Canadian invasion in Philly -- a location of the Canadian franchise Smoke’s Poutinerie is slated to open on our very own South Street, next to Milkboy. In 2017, Reading Terminal will get Fox & Son, a corn dog stand also offering poutine. But always remember: Shoo Fry officially landed first. 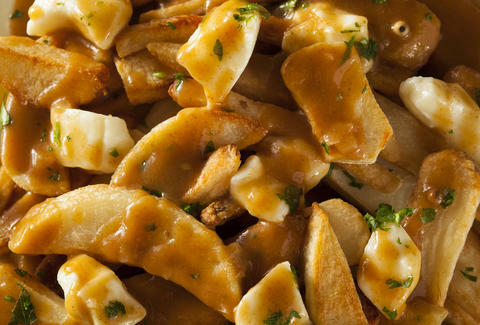 The menu at Shoo Fry obeys the classic laws of original poutine from Quebec, which typically consists of french fries and cheese curds drowning in gravy. Being in Philly and part of the larger US poutine trend in itself, the menu comes with some creative flourishes to reinvent the classic Canadian dish into something distinctly of the city. Most notably is the Cheesesteak poutine, with steak, fried onions, and wit or witout whiz. As a nod to its predecessor, the menu also has the Underdog poutine, with sliced hot dog, sauerkraut, and spicy brown mustard. In addition to a dozen poutine options, Shoo Fry reverses the usual burger-and-fries meal by offering slides as a side to your main dish of fries. The original (American cheese, pickles) is offered along with three other options, including the Pepper G.O.A.T, served with pepper jelly, bacon, and goat cheese. The fries-and-a-side-of-burger combo is perfect for everyone who has ever ordered a burger just to be more enthralled by the sides that came with it. Shoo Fry’s counter service shop retains much of the skin-and-bones that Underdog’s regulars would be familiar with, but with a refreshing makeover: clean white walls accented with green and wood furniture replace the hotdog fists of yore, easing the space of some of the grit we may remember from the old days. An Andy Warhol-esque print portrait of Canadian Prime Minister Justin Trudeau also greets you by the door on your way in. Fries come in sturdy brown paper containers, easy enough to take with you and strong enough not to let all the toppings soak through. This comes in handy if you’re looking to keep eating on your walk home. Expect a rush during lunch hours, sometimes even out the door, though the place calms down quite a bit by dinner time, staying open until 9pm on weekdays. Poutines range from $7-8, making it a cheaper fast-casual lunch option in Rittenhouse; sliders are just $3. If you’re craving fries but not in the mood to deal with all of the toppings, naked fries go for $3, too. If you still feel like there’s something missing, it’s because we haven’t discussed the shakes yet. Though they don’t take center stage here, the frozen drinks are a lovely accent to the rest of the menu. Little Baby’s is the ice cream supplier, so you know you’re in good hands. The dairy-free shake options have a rotating base of questionable (or adventurous?) flavors -- think balsamic banana. 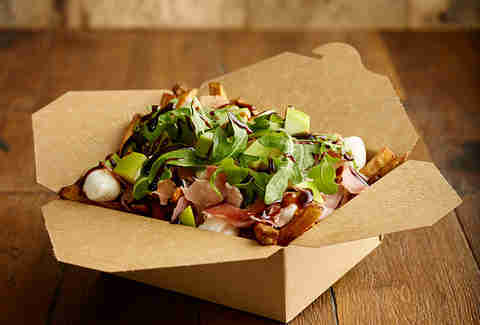 Though the various poutine options dress up the crisp fries, you’d be amiss to consider them among the best in the city. The originality of the concept to the area, however (as well as the late hours and reasonable prices), make Shoo Fry a foreseeable option for the long haul. The popularity of the first location has helped the owners already launch into a second storefront in Fishtown, begging us to wonder if this could blossom into a Federal Donuts-sized local chain. Marielle Mondon is a writer from Philadelphia who feels extra proud of her French heritage when eating poutine. Follow her @MarielleMondon on Twitter and Instagram.